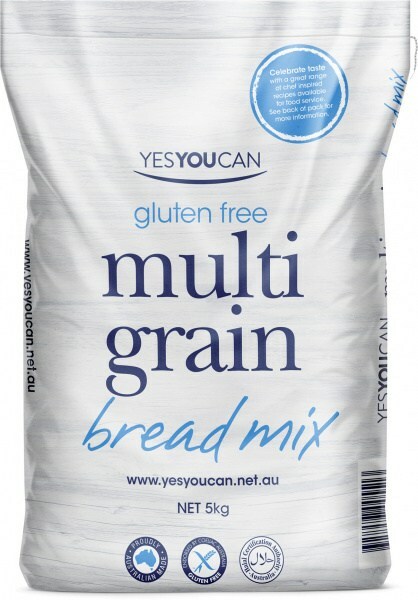 All Gluten-free eaters can now indulge in YesYouCan products that consists of a wide range of delicious and healthy breads, cakes, pancakes, muffins, pizza, flours and reduced sodium salt. Once you try YesYouCan Multi-Grain Bread, you'll have the benefits of eating healthy while enjoying a loaf of fresh baked gluten-free bread. All YesYouCan products are gluten, yeast and wheat free. Ingredients: Gluten free flour (tapioca starch, maize flour, potato starch, hi maizeTM, soy flour, quinoa flour, buckwheat flour) grains and seeds 9.7% (linseed, sunflower seeds, kibbled buckwheat, soy grits) whey, raising agents (500, 575), thickners (412, 415, 461), skim milk powder, psyllium, milk protein, glucose syrup solids, vegetable oil, emulsifiers (soy lechitin 322, 471- halal, 481) salt, thiamin, folic acid.